In Japanese cuisine, bento is a meal in box for take-out or eating at home. 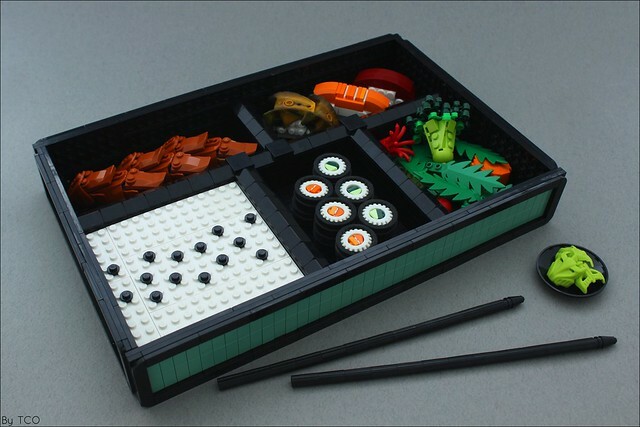 Leonid An has built a delicious looking LEGO bento, which includes sushi rolls, nigiri, vegetables, wasabi, and a hearty serving of white rice. Each dish is able to stand on its own, thanks in part to a diverse range of colors and building techniques. The pieces of nigiri use a mix of curved slopes and constraction figure elements to form slices of raw fish. 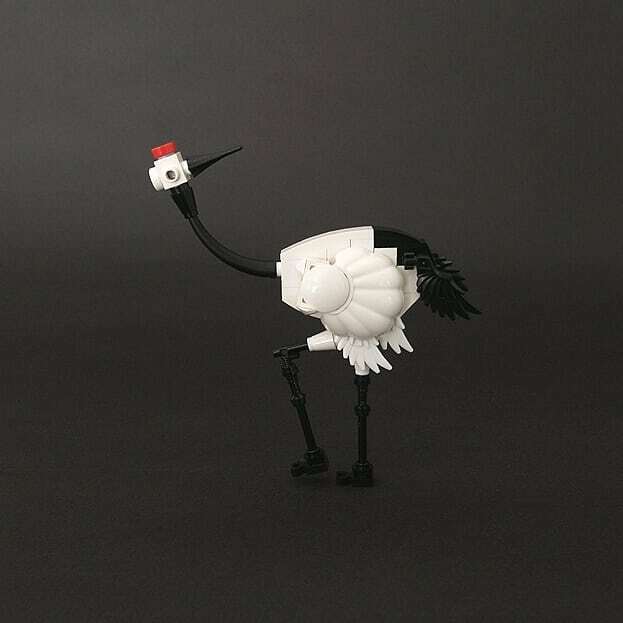 Black tires and white tires are cleverly used to represent the seaweed and rice in the sushi rolls, and lime green Bionicle Krana Za masks are used to form the side of wasabi. Meanwhile, a pair of chopsticks at the base of the box signals it’s time to eat. Itadakimasu! 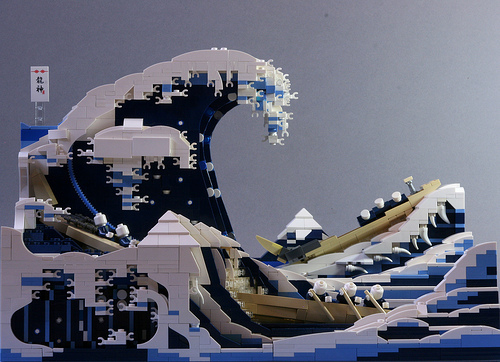 The world-famous Great Wave Off Kanagawa print by Japanese painter Hokusai gets the LEGO treatment in this great piece of work by koffiemoc. The model’s inspiration is immediately recognisable — from the overall colour scheme, the towering wave threatening the three boats, through to the triangular white peak of Mount Fuji in the central distance. The builder has added in some of the more subtle details of the artwork too — the crests of the waves are tipped with clips, capturing Hokusai’s depiction of the water having claws. There is also the triangular shape of the foreground wave, mirroring the form of the background mountain. 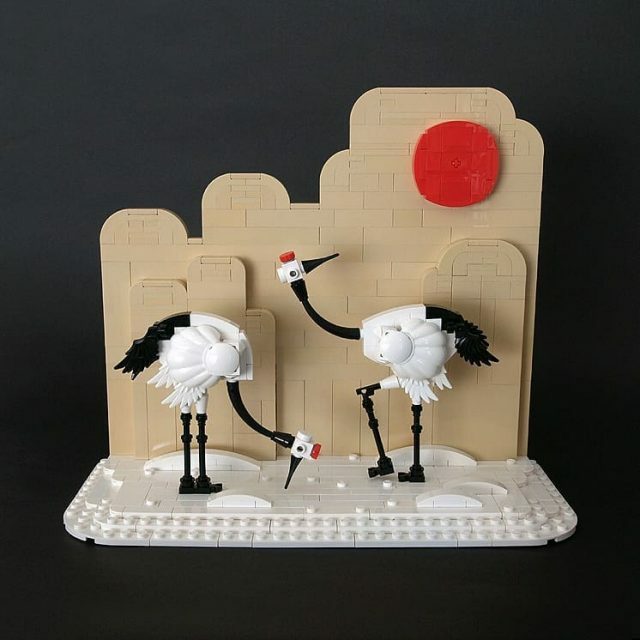 This is a beautiful brick-built tribute to a beautiful image. The cherry tree in blossom has a particular significance in Japanese culture, acting as a metaphor for the Buddhist idea of the transience of life. 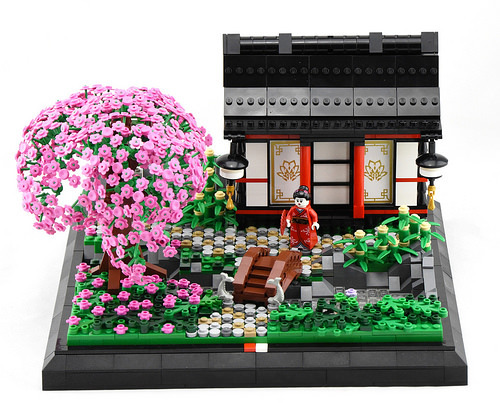 As a result, Ayerlego’s choice to showcase the vibrant pink blooms in his LEGO recreation of an elegant Japanese garden adds an extra level of authenticity to his build. The tree is expertly constructed, carefully arranging its multiple flower stem elements to create the symbolically significant firework-like burst of colour. Setting it against well-selected additions such as the ornamental fish statuettes at the bridgehead, and kimono girl mini-figure completes an aesthetically pleasing display of traditional Japanese life. 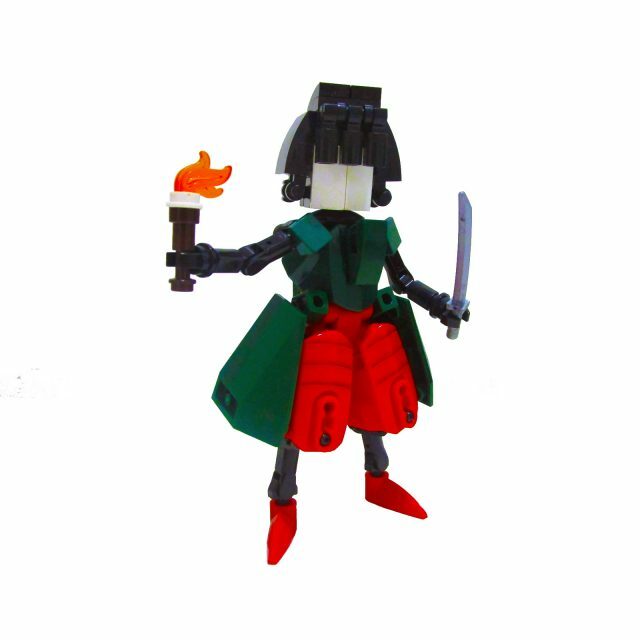 Two or three carefully selected elements are all it takes to create something truly elegant from LEGO and ItouN’s samurai girl Suika makes this a case in point. Combining inverted wedge and red ball joint elements to create flared britches is inspired building at its best. It’s a trend that continues throughout, from the clip plates that double as braided hair through to the pointed red boots; everything here works towards a coherent aesthetic vision. Simplicity in this instance is the very essence of beauty. 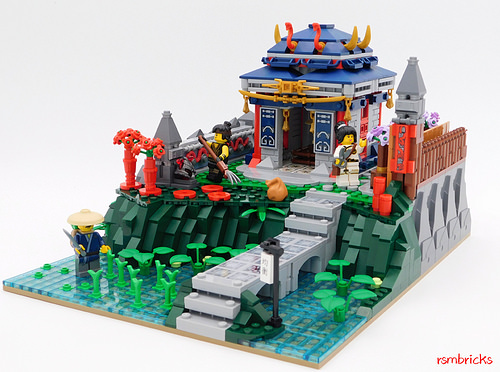 The flower-laden gardens and open paddy fields that surround Rollon Smith’s Snake Samouraï Temple create a beautifully secluded retreat for the noble Japanese warrior. What I find really appealing about this scene is the way the well-selected decorative details, such as the serpent reliefs and the various printed tiles, are balanced against an obviously tended natural landscape. 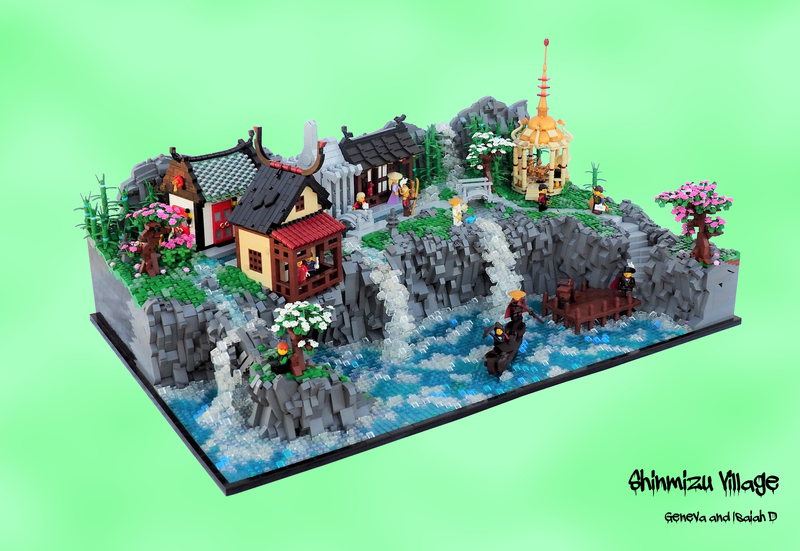 Zooming in you find the minifigure inhabitants of the temple caught in the acts of harvesting rice, pruning plants and raking gravel; and it’s this little nod to Zen aesthetic practice that ultimately makes for such a satisfying build. When it comes to Japanese art, one of the most iconic pieces produced during the late Edo period was Hokusai’s “The Great Wave off Kanagawa.” This masterpiece helped to inspire the character of Hatsusika Hokusai, found in the free-to-play role-playing-game (RPG) Fate/Grand Order. Mike Dung has made two versions of this character, including a cute chibi figure. 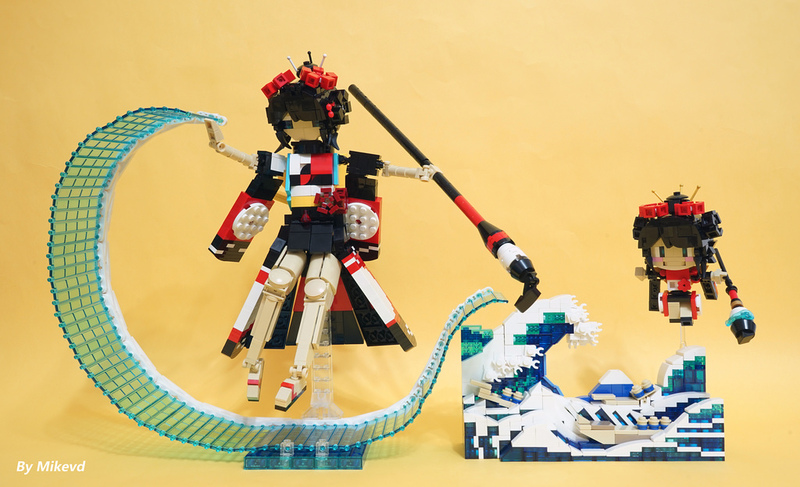 In the chibi-build, Mike’s brick-built wave is instantly recognizable and beautiful representation of Hokusai’s artwork. The wave in the other model is cleverly built with several trans-light blue garage door pieces.